My assignment from Get It Scrapped! 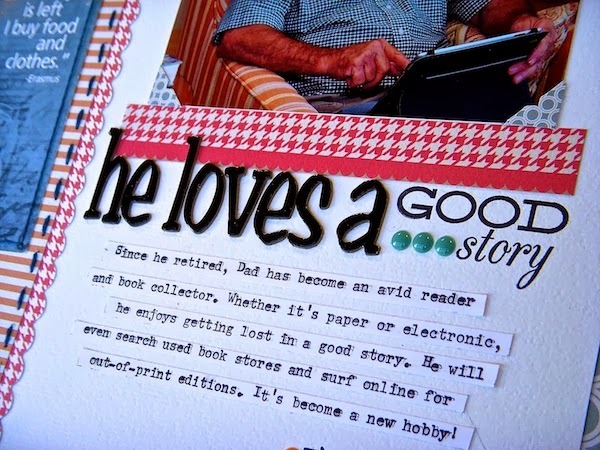 : Embellish your page with something that is not a scrapbooking supply. This page about my dad's love of reading and collecting books inspired me to dig through my collection of bookmarks for an original touch. My found object is this bookmark from amazon.com. Love the quote and the way it supports the story. I added some stitching and a brad to dress it up a bit. You can see what the rest of the design team created in the article here. Have you ever used a supply that is not your typical scrapbooking embellishment? 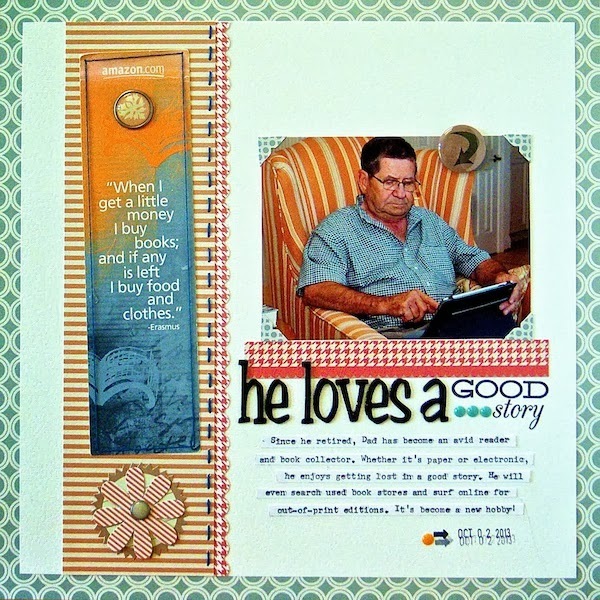 The new issue is up over at Masterful Scrapbook Design. I read through it today and love what I see! You can see it too, for 10 days, absolutely free by clicking the link below. Beautiful layout ! 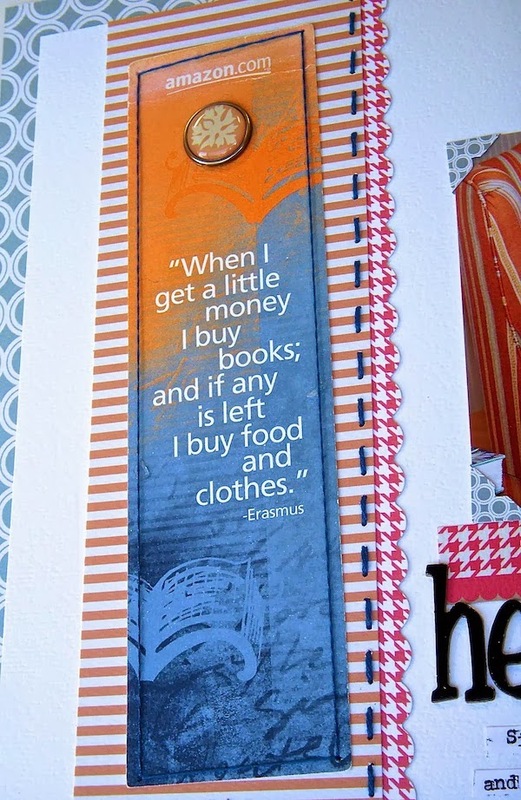 Good idea to include a bookmark. I love that you included a bookmark. Not only is it a great embellishment, but adds a personal touch to the page too. The bookmark is a perfect embellishment for this page...and even compliments the colors in the photo! Looks great, you can always make the simplest embellishment look like enough. Great job. Fantastic job! Love the addition of the bookmark! Great page! Love how you used the bookmark. The bookmark is a great choice for this page and I like how you incorporated it into the border. Great title work as well. I love the addition of the bookmark and your title work! I have a canvas bag with that quote on it! Great use of the bookmark on your page. I like to use found objects - recently used some clothing tags from my cultural memorabilia box & some bookmarks from the library book club on some layouts. Love the idea of using the bookmark on your page Sue! And I love how the Orange in the bookmark picks up the color from the striped chair in your photo! 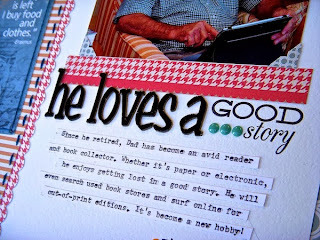 Great photo of your Dad, and I love the title and journaling added under your photo!